You won't find people in North Korea checking Facebook or Twitter for the latest updates on the tense situation created by its leader, Kim Jong Un. That's because the nation of 24 million is largely shut out from the Internet. Few outside the government and military have ever been online. 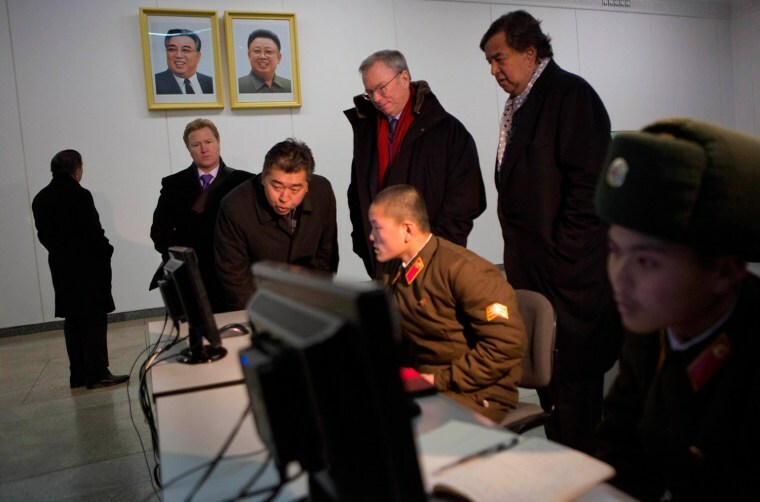 "In North Korea, we don't see evidence that much of anyone has access," Jim Cowie, chief technology officer and co-founder of Renesys, which does global Internet measurement, told NBC News. "You don't see banks or factories or universities attached to the Internet," he said. "In North Korea, Internet is extremely limited. They don't have those resources. There's basically one service provider and that is state-controlled." The country's Internet access physically comes through from China, he said, supplemented "sometimes" by a satellite provider. "We don't have first-hand knowledge of who has access," Cowie said, but Internet use is "very tightly restricted." So much so that North Korea was named one of 12 "enemies" of the Internet last year by Reporters Without Borders, which monitors censorship globally. "We still consider North Korea as an enemy of the Internet," Delphine Hagland, the group's director in Washington, D.C., told NBC News. Other countries making that list included China, Iran, Syria and Vietnam. There aren't many other sources of information available in North Korea, which according to the CIA World Factbook, has "no independent media," with "radios and TVs ... pre-tuned to government stations." About 1 million people in North Korea have cellphones, but they are not phones with Internet access. There may be some exceptions, said Hagland. North Koreans who live near the border with China "can have the (illegal) option of connecting to the Chinese mobile network." In its report, Reporters Without Borders also noted the existence of what's sometimes called a "sneakernet" — that is, people handing off data to one another via physical media, rather than across a network. The North Korea-China border is "sufficiently porous to allow mobile phones, CDs, DVDs and USB flash drives containing articles and other content to be smuggled in from China." North Korea did, for a very short time recently, allow tourists who were staying at one hotel to have Internet access via their 3G cellphones. But that access was yanked within less than a month, according to a report in Wired UK. That brief mobile Internet availability was not tied to Google executive chairman Eric Schmidt's visit to the country, along with former New Mexico governor Bill Richardson. The two had gone to North Korea in January to seek the release of American detainee Kenneth Bae — which did not happen — as well as to promote Internet freedom. Nearly two years ago, the United Nations said that access to the Internet should be considered a basic human right. But North Korea has not gotten — or has ignored — that memo. Schmidt, who met with North Korean scientists and software engineers, said after his visit that the country runs a risk of being left behind economically if it does not provide Internet access. "Once the Internet starts, citizens in a country can certainly build on top of it, but the government has to do something," he told NBC News' Ed Flanagan at that time. "They have to make it possible for people to use the Internet, which the government in North Korea has not yet done." Check out Technology, GadgetBox, DigitalLife and InGame on Facebook, and on Twitter, follow Suzanne Choney.